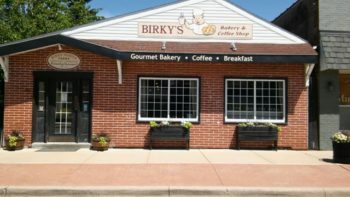 For years, Chris Birky has offered bread, pastries and other foods at Birky’s Bakery and Coffee Shop in Kouts, Ind. Recently, he’s added Bible study to the menu. Birky, a local farmer and lifelong member of Hopewell Mennonite Church in Kouts, is leading a Sunday morning Bible study on discipleship in his bakery for people who are unchurched or who are not regular attenders. When he asked the elders for the blessing to begin this ministry, no convincing was needed. They had been praying about new ways for Hopewell – to turn 100 in 2018– to be church in the community, said Joel Short, pastor of the 90-member congregation and a Bible study participant. People are being drawn to this approach, as the “yeast” of the scriptures does its work. One of the attenders was not brought up in a Christian home, and became a Christian this past year. “It’s refreshing to hear questions posed by someone who has little foundation and comes into the study unbiased,” Short said.